This article was written for the Hermetic Tablet and QUEST magazine, and will be expanded upon in a forthcoming book by Harry Wendrich. Inner visualization is a powerful tool for the work of magic, yet in our modern times there is a strong emphasis on an individual’s intellectual abilities. Our schools praise and test this faculty within our children, suppressing the imaginative nature which, although perhaps known in childhood, by adulthood is almost lost. By the time an individual awakens to a spiritual path, the imaginative faculties of inner visualization have to be relearned and nurtured. Through working with meditation and rituals it can be rekindled, albeit slowly: many give up when they realise that they cannot see angels the first time they step into the astral realms. But those determined and persistent in their desire and efforts to explore the vast untapped regions of their own inner mind will be rewarded with a gradual awakening of the visual faculty commonly called the Third Eye. And there comes a point in this awakening where the Third Eye fully opens – a profound experience, presented in this paper. Those that are working on their magical path will come across the energy points within the human body and in the Earth itself. In the Earth, these energy points are felt as magnetic energy. The Ancients believed that this magnetic energy came from an eternal life force or soul essence that could be harnessed in the form of standing stones. And over years of working with archetypal forces depicted in the Major Arcana of the Tarot, I have realised that these forces are not only experienced within the subconscious areas of the human mind but are interlaced within nature, in particular the soul essence of the Earth. The interplay creates a physical healing within the body and the land itself, linking nature with the human gestalt in a very magical way. Archetypes express the influence of the constellations and planets. These archetypal forces are generated and are projected or radiate outwards by spinning wheels called chakras which are focal points for certain levels of consciousness. 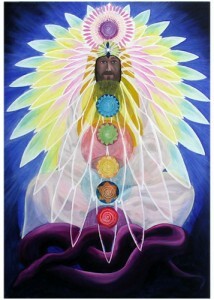 The Eastern concept of chakras is well-known in the Western Magical Tradition. The chakra system was established by the first kundalini master, Tirthankar Parshvanath c 877 -777 BC. This system has been used ever since as a means to connect with the Higher Self. Parshvanath was depicted with seven serpents above his head, representing the seven chakras, showing that from the earliest times chakras or vortices were associated with serpents and consciousness. The seven chakras are connected to a central channel, beginning at the Third Eye (the sixth chakra) then curving up to the top of the head and down to the lower back. If the chakras are out of balance there can be a feeling of dissatisfaction, pushing the conscious point into finding new stimuli outwards, within the material realm. There are seven main chakras corresponding to the seven rays (colours of the rainbow). To recap, chakras are connected to the spiritual body rather than the physical body. They are levels of consciousness that can be expressed through archetypal structures, forming a living, conscious magnetic field similar to a web. It is within this web that magicians create synchronicities which can be to their advantage. Manipura, the third chakra (the solar plexus chakra), is placed just above the navel. It is known as ‘the fire of material consciousness’, is connected with inner vision, and is symbolised by a golden, ten-petalled flower with a downward-pointing triangle in the centre. Manipura means ‘resplendent gem or diamond’, and its yellow colour connects it to the mental body, although Manipura also governs the emotions. The balancing of this solar plexus chakra thus brings control of both the mental faculties and the emotions. The Celts understood the concept of manipura through their deity Cernunnos, who awakens our need to reconnect to the land and to understand our place within it. He is depicted with a serpent in the left hand and a torc in the right. The serpent represents the male seed, and the torc represents the feminine principle and communication with the gods (a symbol of inner vision). There has long been an understanding that there is a link between sexual energy and vision. However, there is a difference between using sexual energy for procreation (a downward energy) or for raising it in the form of a serpent or serpents (an upward energy). The downward sexual energy seeds the womb with a new consciousness within a new life, but the upward, spiritual sexual energy, which takes the form of a serpent, impregnates higher forms of consciousness (mind) within the individual. Yet the principle is the same: the movement of a seed to a place where it can germinate and produce a new level of consciousness is a fundamental law on all levels of existence – physical and spiritual. The Third Eye, or Brow Chakra, is called Ajna, which means ‘command’ or ‘summoning’. It radiates the colour of Indigo, a colour associated with deep inner knowing. Ajna is connected to the pineal gland. Manipura is connected to a second mind or brain which has been scientifically confirmed and has a mode of research called neurogastroenterology. This second brain, located in the stomach area, is called the Euleric Nervous System, and among other things it regulates our moods and emotions and can be responsible for the ‘feel-good’ factor. It is the work of manipura to connect the brain of the stomach to the head via the Third Eye. The opening of the Third Eye begins in manipura with a seed. There is no need for ritual work to start the process. Traditional methods to stimulate manipura include yoga postures such as ‘the Cobra’ and breathing exercises such as Pranayama (rapid breathing involving movement of the diaphragm), but, although these methods may stimulate the third chakra, in order for the seed to develop, a concentration of Divine Light needs to be drawn down into the body through meditation, such as the example given below. Visualize a beam of Light coming down from the spiritual sun into the top of your head. It lights up your head and moves down, lighting up your entire body. Your body is dark. As the Light penetrates the darkness, visualize the darkness seeping out through your fingers and toes. Hold the visualization of your body filled with Light for as long as you are able. This purifying process may over many weeks or months ignite the manipura gem –the Light congeals into a ball or seed of light within manipura. This could be in the region of a six-month period of daily Light Body Meditations. In my experience, once aware of it, my conscious point began to play with the ball of Light. I discovered that I could make it expand and contract in size. At a certain size it would not expand any more but would explode, releasing ripples of light which were perceived with my naked eye as they passed out of my body, showing that this was an energetic substance of crystallized light. Eventually, I discovered that my conscious point needed to remain passive in order to allow the gem, which always returned, to work its own magic. Once my will relinquished control of the seed, it began an erratic journey upwards until it reached a vesica-shaped opening within my forehead, into which it entered and disappeared. Following this, a beautiful flower of immense size unfolded, petal by petal. Each individual may experience this phenomenon in different ways, but the principle is always the same – manipura initiates the opening of the Third Eye. Once the Third Eye has fully opened, it closes again, for safety. It is not good to be too sensitive in our dense material realm. But the conscious point of the soul is now active in the Third Eye region, where it can be directed by Divine Will, i.e. beyond ego control, or through meditation directed by inner spiritual guides. The Third Eye becomes a powerful lens in the search for occult knowledge and understanding, and can be likened to a spiritual telescope or microscope into higher or deeper levels of consciousness. Magicians, through the art of ritual, can precisely direct the Third Eye into realms wherein the magician has an interest to learn, discover or work. It must be remembered that whatever is being viewed with the faculty of the opened Third Eye will affect that which is being viewed. The Third Eye is a high form of consciousness, wired up to the visual mechanisms of the imagination. When it is focussed upon an inner realm area, the meditator actually touches that which is viewed with his or her unique level of consciousness. This reverberates into the physical environment and, in some cases, cause dramatic affects within the surrounding environment or atmosphere. It has been suggested that to experience the opening of the Third Eye is to experience enlightenment. However, the opening of the Third Eye is not the end of a spiritual process, but the beginning. In my experience, it has facilitated my understanding of my True Will and the spiritual work that this entails. The opening of the Third Eye has a Tower effect, where nothing will remain the same. Copyright © Harry Wendrich, 2014.